Safety glasses can also look good! 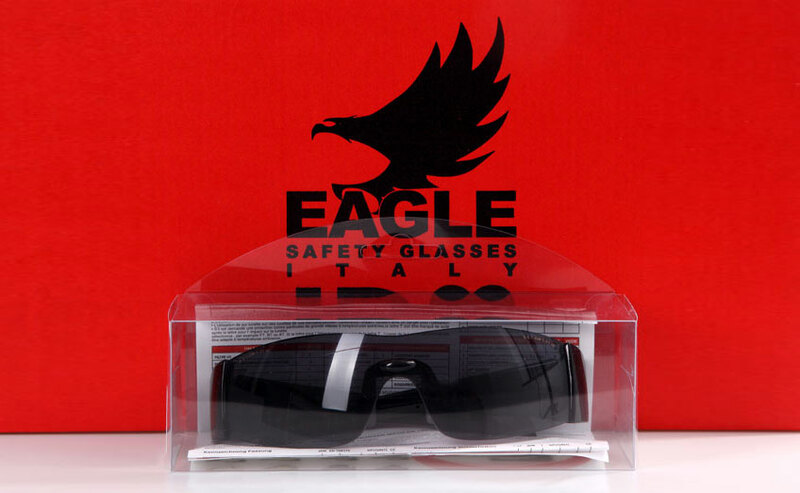 The Italian manufacturer JDM, based in Macerata, creates certified safety glasses under their brand "Eagle" for work and sports. They have much experience, and a highly skilled team of engineers, working on the best ways to develop professional safety glasses for occupational safety, as well as for sports. Fashion and design aspects are not ignored, but are rather integrated, so that protection and attractive appearance are combined in a functional and stylish piece of safety equipment! These glasses are comfortable to wear and light weight. The temples (ear pieces) can be removed by pressing a small tab inside, and replaced by the supplied goggle strap. Identical to the model above, but with dark lenses for good sun protection. Very light, sleek and comfortable to wear. No foam seal means that air ventilation to the eyes is improved. Frame: Comfortable frame, ergonomic and durable. Extremely slim glasses to ensure the best comfort during using it. Superficial soft touch frame treatment ensures excellent comfort at the skin contact points. This economy model is very attractive and extremely easy to wear, with its bright red temples. Since the field of view is not limited by frames, one hardly notices that one wears glasses. The bright red temples are made from composite material, and therefore very comfortable to the touch. A soft nose bridge considerably increases the comfort. Comes with Microfiber carrying bag. Frame: Ergonomic Frame, comfortable, flexible and resistant. Temples and nose pads are composite. Frames clear with red temples. If you need reading glasses while working, these corrective safety goggles are right for you. You only need to know the values of your reading glasses to be able to order the correct model. Temples and nose bridge made of composite material allows comfort. The frame is gray, with a softer, dark component where the glasses make skin-contact. Microfiber carrying bag and goggle strap included. Areas of use: General Industry - Industry Metal mechanic (grinding, turning, milling, woodworking)- Health- Free time. Suitable for individuals that after the age of 40 who have some vision problems stemming from presbyopia. Economy glasses with large dimensions that allow prescription eyeglasses to be worn underneath. Good lateral and frontal cover. Made entirely of hard polycarbonate; not quite as comfortable as the softer plastic models, but perfect in its protective function. Economy glasses with good facial coverage and tool less temple adjustment. Spacious enough to allow reading glasses to be worn underneath. 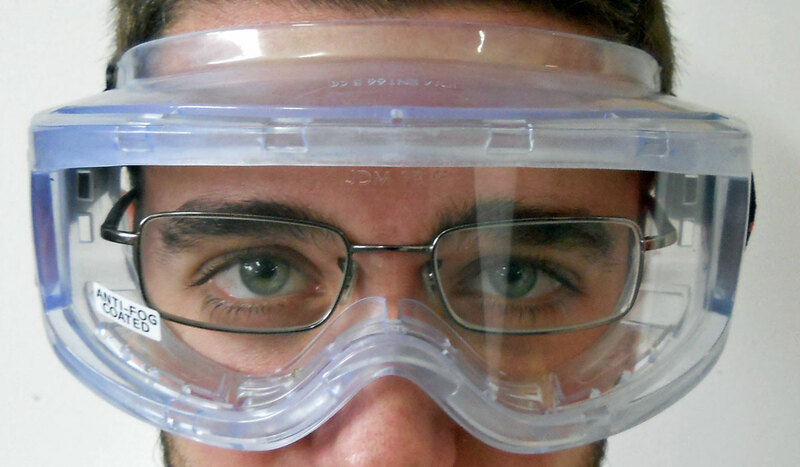 Goggles with complete coverage to prevent against lateral penetration of dust goggles and other contaminants. These have an elastic head strap and are large enough to be worn at all times over pair of prescription glasses. 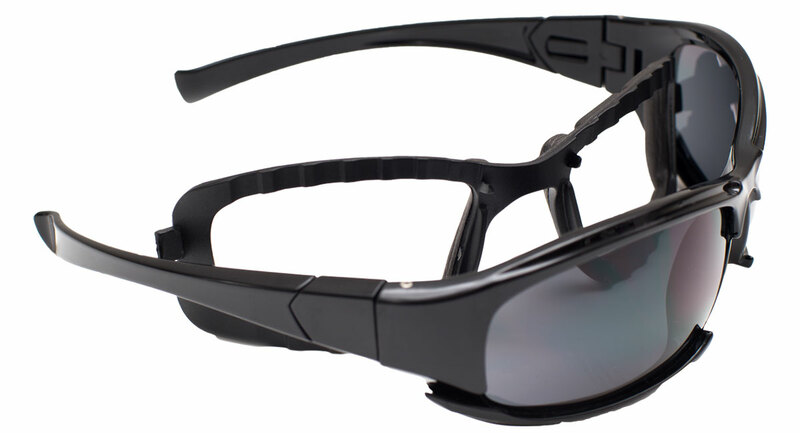 Frame: Ergonomic frame; comfortable, complete coverage and high resistance. With adjustable elastic band. Allows the use of prescription eyeglasses. FDMZI Useful to keep and clean glasses. Maintenance kit for lens and screens.